Go is a board game for two players, called I-Go in Japanese, Wei-chi in Chinese and Baduk in Korean. It is played on a board with black and white game pieces called stones. Players take turns placing a stone of their color on intersections of a 19x19 square grid. The player with the black stones goes first. A normal Go board has 19 rows and columns of lines. Some players use 9x9 or 13x13 boards too, such as new players, because smaller boards usually mean shorter, less complex games. A game of Go ends when both players pass their turns without playing. This usually happens when adding another stone to the board doesn't change the score. 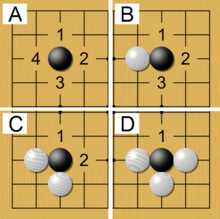 The winner is the player whose stones surround more empty intersections (points), along with captured stones and komi. The player using the white stones is given a komi (extra points) because the player with black stones has the advantage of going first. A game can also end when a player gives up and resigns if they don't think they can win. In a game against a skilled player, a less skilled player may be given a "handicap" of extra stones on the board at the start of the game as well as playing black. These rules help make the game and final score fair for both players. The four liberties (empty points that are up, down, left, or right) of a single black stone (A), as White reduces those liberties by one (B, C, and D). When Black has only one liberty left (D), that stone is "in atari". White may capture that stone (remove from board) with a play on its last liberty (at D-1). Examples of when the Ko rule applies. If white player puts a stone in the green circles and captures a black stone, the other player cannot capture the white stone right away - they must play somewhere else on the board first. Rule 1 (the rule of liberty) is that every stone remaining on the board must have at least one open "point" (an intersection, called a "liberty") next to it (up, down, left, or right), or must be part of a connected group that has at least one such open point ("liberty") next to it. Stones or groups of stones which lose their last liberty are removed from the board. Rule 2 (the "ko rule") is that the stones on the board must never repeat the way the stones were the turn before. Moves which would do so are forbidden, so only moves elsewhere on the board are allowed that turn. This is to prevent the game from going on forever. Some Go teachers tell their students that the stones represent armies. If the armies don't have empty spaces to move into, they can't survive against the enemy armies. Therefore, stones of one color that are completely surrounded by another color are captured and removed from the board. This is the only time that a stone can be moved after a player puts it on the board. Stones share liberties, so that a group of stones are all "alive" as long as one stone is next to an empty intersection. Stones with no liberties (no access to empty space) are captured and removed from the board. At the end of the game, the prisoners are usually deducted from the score of the player who lost them. The second rule is called Ko (eternity). You can place stones on any clear intersection you want, as long it isn't taken off right after, or the board looks the same all over as it did before. This is to stop the game from going back and forth capturing the same stones forever. Players must make a move somewhere else on the board during a "ko fight" before they can re-capture a stone in the same position. Go and chess are both board games and strategy games, though both may be used as gambling games as well. They both have no luck or secret information, unlike some other classic games like backgammon (dice are rolled) or poker and other card games which also have secret information. There are many places to play Go on the Internet, as well as local clubs and national organizations in many countries around the world. A 2016 survey by the International Go Federation found that there are over 20 million players around the world. Most players live in East Asia. ↑ The International Go Federation (February 2016). "Go Population Survey" (PDF). Retrieved 28 November 2018. ↑ "A Brief History of Go". American Go Association. Retrieved March 23, 2017. ↑ Murray H.J.R. 1951. The history of board games other than chess.p89–90 Oxford. This page was last changed on 10 December 2018, at 02:02.